The SEMA Memorial Scholarship program offers financial assistance of up to $5,000 to help foster the next generation of automotive aftermarket industry leaders and innovators. 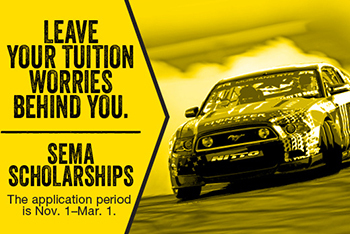 Students can apply at www.sema.org/scholarships. The submission deadline is March 1, 2017. Dozens of awards ranging from $2,000 to $3,000 will be given out, with a $5,000 award going to the top student. For more information on the program, contact Juliet Marshall, SEMA manager of education projects, at 909-978-6655 or julietm@sema.org.